This fat lady was the subject of discussion today during ‘Angels and Demons. There were questions mainly about, the mask like, unreadable expressions, the color of the background, described as “jarring’ yellow, dominating over the figure. The figure was said to create a sense of alarm. 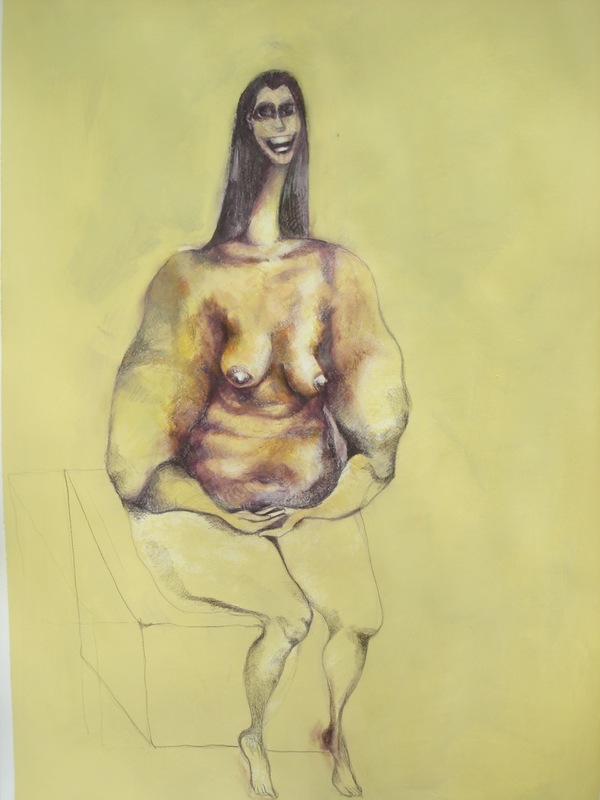 There was discussion about the how the figure was merging on within the background, however the disproportionate seat remained a matter of concern. The yellow paint resonates with my own skin tone and therefore natural though there were some speculations about the color psychology and whether another color or version of the same color could have been used. The fact that the paint was given to me and not purchased raised yet once again the issue of exclusion of purchasing art supplies from the year long no shopping project. While I see a reason for this query, after reflecting over it, I would stand my ground. purchasing Art supplies is not “shopping” to satisfy desire. It is a matter of existential sustenance. The smile and expression are indeed a mask to hide the conflict, a refusal to let the true emotions show, an attempt at normalcy through distress. But above all it is mockery directed at self and the surrounding. The disproportionate body addresses the psyche of self imagery. The year of no shopping has indeed marked a change in my relationship with food , as I try and find substitutes for spending on material goods. All the above issues raised today have provided an insight to how these drawings are being read by the viewers. I find an urgency building up to show the core of my project, what shopping is in a modern society.